We offer a wide range of Qigong classes, workshops, seminars, free gatherings, health retreats (in Sydney, other parts of Australia as well as in China and elswhere). 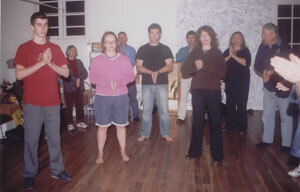 Call or email us to book an initial consultation and start learning your desired Qigong. As you'll notice some styles of Qigong are quite expensive, especially if taught privately, so to avoid paying too much, choose wisely. There are still many great styles that are very affordable or you can attend group sessions and workshops, look for special deals offered, such as discounts for ‘early bird' payments, for senior citizens, disabled/handicapped people, school children and so on. The reason why some styles of Qigong were, and still are, kept secret and are so expensive is explained in the article True Values Lost In a World of Illusions . NOTE: There is a 20% discount for payment in advance for the whole course. Learn how to perform this ancient form of self healing in 3 easy sessions.